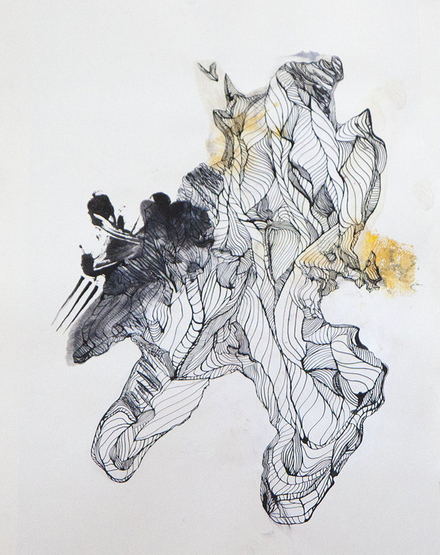 Recently, I caught up with Lisa Patusky ’14, whose Senior Thesis Show, “In Formation,” opens in the List Gallery of Swarthmore College on April 10th. Patusky, a Studio Art major with minors in Art History and English Literature, works in sculpture and drawing. 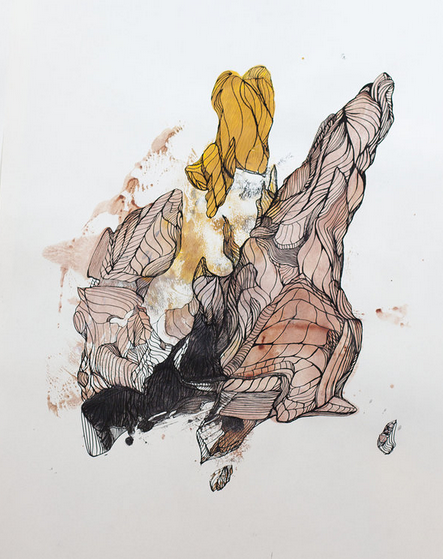 Her muscular, almost-human abstract clay forms interact with her line drawings, creating an endless dialogue on the complexities and relationship between three-dimensional and two-dimensional works of art. She is fascinated with structures appearing in nature and using them to communicate with her audience and play with their perceptions. I On the Arts: For my first question, how did you get started making art? What's your background and your training? Lisa Patusky: I started in high school––I mean, everyone is required to take classes when you're even younger, but in high school is when I got more serious. My teacher made me realize it was an opportunity that I could pursue after high school. So when I came to Swarthmore, I signed up for the first year seminar "Making Art" with Logan Grider. And since then, I've always known I would be a studio art major. [As a kid I was] always interested in making things or solving problems. I've always been active in painting random stuff or drawing or doodling. IOtA: So what's your main medium? IOtA: ... And it just changed your life! LP: Yeah, and since then... I still do drawings, but I call myself a sculptor. IOtA: What's going to be in your show? What's the background of the works that are in the show? LP: It's going to be a combination of sculpture and drawings. The sculpture has a wide range [...] I changed how I built. I started building this year. I've always thrown in the past, and now I’m doing slab building. 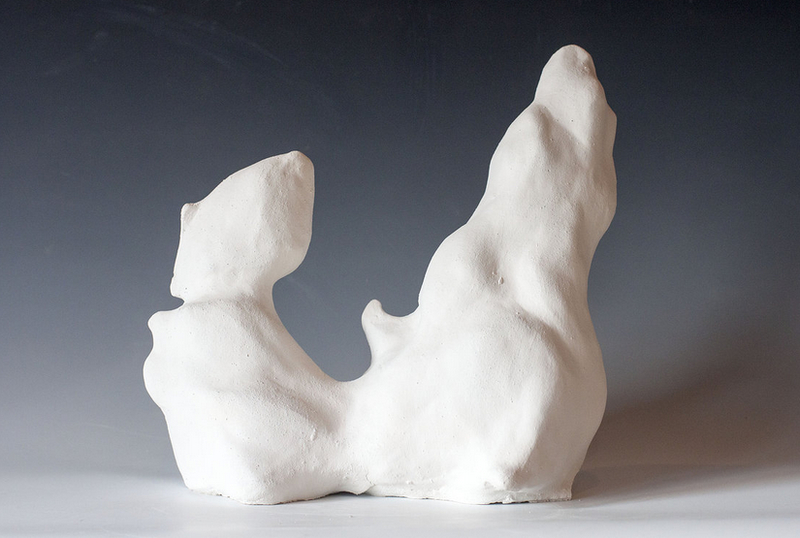 So there's a difference––throwing is on the wheel, so it [has] the centricity of the circle, but now I'm doing slab building and they're more natural forms. I take a [slab] of clay and form it and add more details as I go. And so it's more natural, there are a lot of natural elements [...]. IOtA: ... Sort of abstract-organic objects? LP: Definitely. My most recent are taller white pieces. The main part is a central blob [...] but then I sculpt that into flanks and muscles and bone structures. But you couldn't actually see a figure, per se, directly. So it's not a very literal transcription, but I definitely [use] the knobs of trees, or all those types of things [in my clay pieces]. IOtA: What made you pick that kind of sculpture? Why not portraiture or something more literal? LS: It's almost as simple as literal [figurative reproduction] has been done before. Since the beginning of Western art, it's been literal. I never really saw myself making abstract art, but that's the thing that really excites me. It wasn't the pristine copying of the tree trunk. 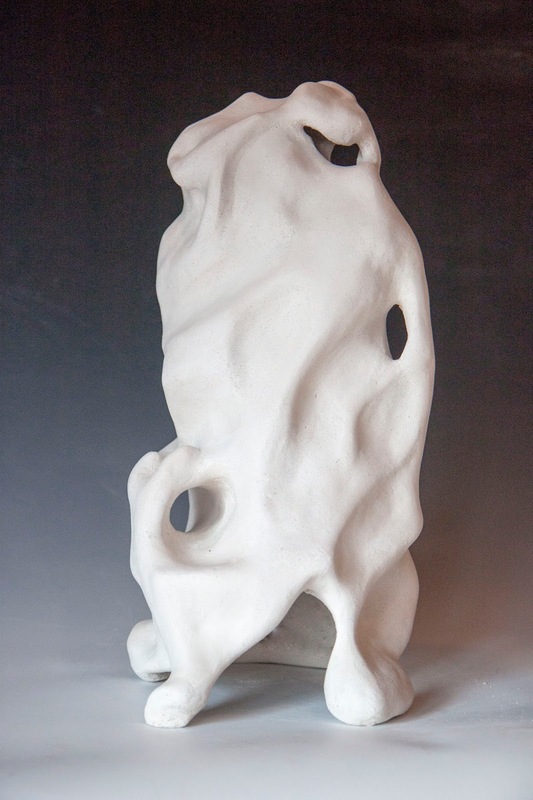 Especially how my 2-D and 3-D works interact––it's an exercise with perception, like what can evolve from this nothing, this abstract form, into something that you can relate to many other things. IOtA: What was your concentration for your show this year? LP: I'm in Senior Workshop. It's both semesters, and we have our own studio space in Beardsley. I started off entirely differently. I started off from something I worked on in Junior Workshop, which is stacked forms that I intricately carve, because I'm really interested in line, and they took on a figural aspect because they're very tall, with the slopes of bodies. And then I always had a type of head. It was abstract as well. But then that totally switched. I got off of that and just started playing with slumped forms. They almost took their own shape, and I built off that once I started seeing it in my own work. But of course, the first ones were influenced by things I was looking at. A lot of of the things I look at are natural patterns and [recurring] in nature. And so by looking at so many obscurities in nature, it was being pulled back into my work. Syd Carpenter, my professor and mentor, says, "Notice what you notice." I didn't notice what I was actually seeing. I've always been like, "What do I notice?" It's actually a hard question to answer, but I noticed what I notice by what was coming out of these forms that I made really quickly and let them shape into things on their own. And so that's how that question was answered. IOtA: What do you hope to do with your art once you leave Swarthmore? LP: Well, right now I was accepted to a sculpture program in Philadelphia, so I'll be doing that. And then after that, my goal is to go on to an MFA, which that's the terminal degree in art, so that means I can be a professor with that. It's not necessarily my end goal, but definitely... a way that I can be active in the art community, make money, and still make work on my own. It's definitely a big consideration. I'm also interested in looking into design work, but it's still up in the air. There are so many more skills to acquire right now, but I'm excited about this summer sculpture program. LP: Interesting [...] I guess my work, in a way, is really involved with line and form and volume. But since I'm working with 2-D and 3-D renditions of the same form, I want people to question how they see things and really evaluate the ways in which they see things in their everyday lives, the environment around them, and how we transcribe that between photographs and actually experiencing it in the 3-D and physical world. Just what do you see, and how are we seeing it [from] different [perspectives] right now? What a great interview! And I love what how she describes her work!